Observed on undersides of Large-leaf Cordia (Cordia africana) leaves. Nairobi, Kenya, March 2013. Length of the largest white-pink bugs is less than 2 mm. This group consists of adult females and many nymphs. The ants belong to the subfamily myrmicinae, which are endowed with painful stings. Mealybugs have very, very short legs. If nudged gently they will reluctantly start crawling away. So it would seem that they would be entirely vulnerable to insect-eating birds, lizards and spiders. Their abundance belies this notion. Indeed they have several good tricks to survive and reproduce. What makes them mealy is a coating of wax particles secreted by glands on the abdomen which apparently makes them unpalatable to many predators. Mealy bugs also secret sugary substances that attract ants that serve as stinging, biting body guards. Some mealybug species are very specific as to the species of plants used while other mealybug species have specific hosts. Despite their defenses the many kinds of mealybugs are parasitised by a variety of very small wasps and preyed upon by lady bird beetles and lacewings. 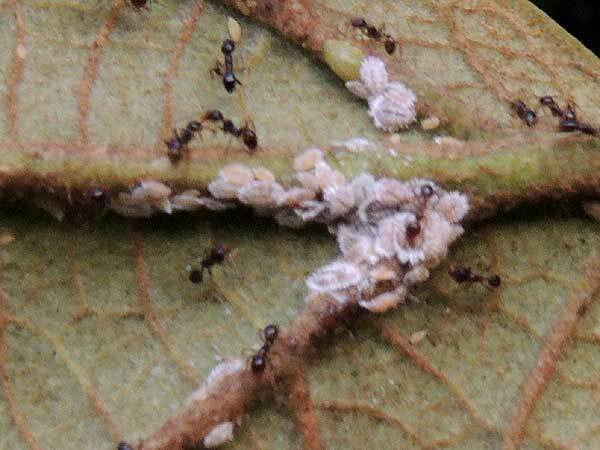 Mealybugs often become conspicuously abundant on house plants and in greenhouses because the wasp parasitoids are not able to function or are absent. The bugs shown here were on the grounds of a public place. It is quite possible that they were abundant here because pesticides were used to control some other pest, like mosquitoes. The pesticide killed the tiny wasps that kept the mealybugs in check and so their numbers exploded.